Sometimes it's more of a trick to get the hooks OUT of a fish than it is to get them in. When practicing catch and release, removing hooks quickly and with minimal damage is important. It's a big determinant in whether or not the fish survives to fight again. The Bass Pro Shops Squeeze-Out Hook Remover is, in my opinion, one of the best tools on the market for getting hooks out quickly. It is built around a 7-inch tube with a spring-loaded squeeze-grip handle. A small gripping arm loops over the hook — either treble or single — and then as you squeeze the grip the hook is pulled into a slot in the end of the tube, trapping it in place. The design allows you to grip the hook tightly with minimal effort, and the small tube easily slides down the throat of a fish, while leaving space for you to see what you're doing. It's affordable, too, at $9.29. The Angler Tec Fish Hook Extractor, is the ticket for larger fish and toothy species like bluefish and cudas. It's available in 8.5- and 14.5-inch versions, making it possible to reach WAY down the throat of a deeply hooked fish without endangering your fingers. This stainless steel extractor also features the spring-loaded gripping arm that traps the hook into a slot in the end of the tube. It functions with a trigger-grip arrangement that some anglers prefer to the two-finger plunger-type, above. These removers are more expensive but highly effective. The Offshore Angler™ Hook Remover is a classic wire "fish flipper" — a favorite of charter boat skippers. It is 9.5 inches long and inexpensive at just $7.99. Simply slide the wire loop over your running line, hold the line tight and slide the remover down to contact the hook. Pressure turns the hook over, and you shake the fish off, often without even having to touch it. The Bass Pro Shops 5 1/2" Forceps are perfect if you use tiny hooks to catch bait or to fish for panfish or cold-water trout. These stainless steel surgical tools allow you to grip small hooks tightly and twist them out quickly. They feature locking jaws and can be carried by pinching tight to a flap on your fishing shirt or vest. At $6.79 they’re an affordable addition to your tackle kit. Bonus Tip: no matter which hook remover you use, it's a good idea to carry it on a retractable lanyard. Otherwise you'll lose your grip sooner or later and send it into the briny. An ounce of prevention, as usual, is worth a pound of cure. Frank Sargeant is long-time outdoors editor of The Tampa Tribune and a senior writer for Florida Sportsman Magazine as well as for B.A.S.S. Publications. 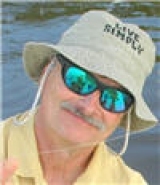 He's editor of The Fishing Wire and a regular contributor to BoatTest.com. He's also former senior script writer for BPS Outdoor World Television and former regional editor for Outdoor Life. His work has won over 60 national awards, including the ASA Homer Circle Fishing Writer of the Year Award in 2011 and the National Marine Manufacturers Association Boating Writer of the Year Award in 1992. He's author of 10 books on fishing and boating, and founder of the Frank Sargeant Outdoor Expo, Florida's largest all-outdoors expo for more than 20 years. He was a flats fishing guide out of Homosassa, Florida, before becoming a full-time writer.